Electronics had yet to invade our youthful agenda. Except for an occasional coonskin cap, the only media (and this one was on paper) that universally influenced young boys dealt with the witty way Tom Sawyer got his friends to whitewash that fence. Even popular shows like “Howdy Doody” pointed children to outdoor activities. That was then. Now, you sit on the edge of your seat, anxious and excited at the same time. It’s a ritual being played out all throughout the land. In living rooms, bars and just about any place capable of holding a large screen TV and a tableful of crunchy snacks, we share this national experience – the Superbowl – fanatics and neophytes alike. Why? What fascinates us about this game? Why have television networks, advertisers and promotional campaigns paid so much to affiliate themselves with this singular event? Ah, “event.” That’s the key word. The Superbowl has become the event of choice across our nation. Why, it’s very likely, in certain years, more people watch the Superbowl than vote on Election Day. But before you sit down to watch the ultimate football game of the year, if you really want to impress your fellow partygoers with your acumen for all that is the game, you must first read The Best Game Ever, by Mark Bowden, a long-time reporter and national correspondent and author of Black Hawk Down. 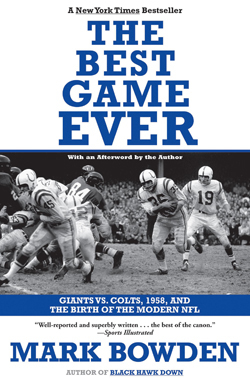 The Best Game Ever chronicles what many consider to be the greatest individual football game ever played – the 1958 Championship between the New York Giants and the Baltimore Colts – and how it spawned the modern NFL. It pitted the elegance of cosmopolitan idols like Kyle Rote and Frank Gifford against the plebian normalcy of growing suburbia in the guise of Johnny Unitas and Art Donavon. On opposing sidelines strolled Vince Lombardi, Tom Landry and Weeb Ewbank. So many names from this game represent the elite of the football’s history. Even the day’s benchwarmers – including Don Maynard and Jack Kemp – later became Hall of Famers (and a little bit more in the case of Mr. Kemp). Bowden does an excellent job capturing not only the smell of the pigskin, but the bygone era in which they played the game. What made the contest such a watershed, and which its much ballyhooed sudden death finish amplified, was one simple fact: it was televised. Though the 1958 Championship represented the third time the season’s final game was aired on those vacuum tube dinosaurs, this one would be the turning point for the marriage of the sport and television. As the close game seesawed to an eventual tie at the end of regulation, the afternoon broadcast became a prime-time broadcast. And the viewers had a chance to watch history unfold as, for the first time ever, a Championship game had gone into sudden death overtime. Bowden correctly points out that, while baseball was made for radio, football was made for television. Does it surprise anyone that we saw the ascendency of television over radio and football over baseball as simultaneous events? And with advances in film technology – including instant replay and slow motion – the game and the media only became more symbiotic. But while most focus on the game’s consecration of the marriage between football and television, the real story of the game remains the players and the America that used to be. Those players, less celebrated than their baseball counterparts (and even college football players), then more closely resembled the humble reality of the spectators. Bowden concludes with what turns out an apocryphal metaphor. Alan Ameche, who scored the winning touchdown, stayed in New York after the game and appeared live (and did little else) that night on the Ed Sullivan Show. Johnny Unitas, game MVP, turned down the offer to appear on the show, opting instead “to go home with the boys.” When he later returned to pick up his MVP prize – a brand new Corvette – he quickly traded it in for a family-sized vehicle and returned to civilian life. But the game changed the nation in a different way, as Johnny Unitas would soon discover. His sandlot heroics appealed to the can-do nation. Boys shed their Daniel Boone Coonskin Caps to get crew cuts like their new hero Johnny Unitas. And as an omen to the Michael Jordan-Nike era two generations later, sales of high top shoes – the kind Unitas wore that day – soared, as did the aura of Unitas. But the game also signaled the end of the simple honesty of the brainy individualism of Johnny Unitas. With TV ratings a driving force, the game today demands quarterbacks fit into in a plug and play world. Even Unitas’ heir apparent – Peyton Manning – despite his on-field command, operates with the cold precision of an antiseptic machine. Where Unitas once drew plays in the sand, Manning more likely uses an electronic whiteboard. Where boys once escaped reality by gathering with friends to play football on vacant fields, now they prefer the individual solitude of virtual reality with John Madden. Ironically, the man most responsible for the for the birth of the modern NFL would neither fit in today’s high tech league nor, sadly, find anyone to play with on those now empty sandlots. But, for one brief, shining moment, it was the best game ever. It was the best America ever.